If you grow hydrangeas and have wished the beauty of their flowers would stick around long past when they are in bloom, you will be glad to hear how easy it is to dry and preserve the flowers. Hydrangeas are one of those flowers that almost dry themselves. Once dry, they can last and look beautiful for years. You can dry hydrangeas several ways, but water drying hydrangea flowers, explained in this article, helps them retain their color and last longer. The biggest challenge in drying hydrangeas is timing when to cut the blossoms. If you cut them in peak bloom, they have too much moisture and don’t dry quickly enough to retain their beauty. Too late, and they’ll just turn brown. It can be hard to judge readiness with hydrangeas like 'Annabelle' that only go from bright white to pale green. The following steps should help you out, but in all honesty, some years it's impossible to find flowers that are ready to cut that don't have any spots of brown on them. If that's the case, you can always remove the individual brown flowers, either before or after drying. The ideal time to cut hydrangea blossoms for drying is toward the end of the season, August through October, when the larger petals, which are really sepals, are starting to fade or change color and the tiny flowers on top of the colorful sepals are just beginning to open. If you can't really see the tiny flowers on your hydrangea variety, you can simply judge by the changing shades of color. Don’t worry too much about being exact. Hydrangeas are forgiving flowers; you can simply let them dry on the plant until the sepals feel papery. You might not get the best color and they won’t last as long as the water dried method explained below, but it sure is easy to do. The only time drying hydrangeas on the plant is a bad idea is during a rainy season. The flowers will turn brown before you get a chance to dry them. 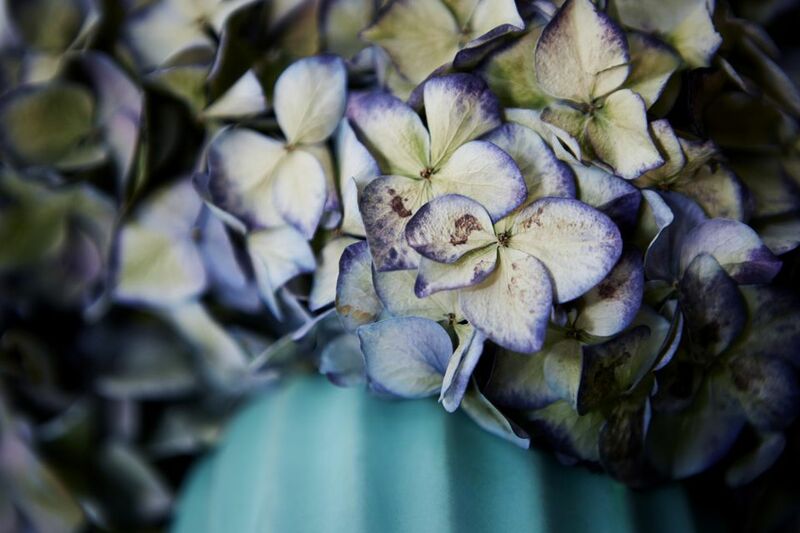 The water drying method helps hydrangeas retain their color while drying, and stay attractive for months. 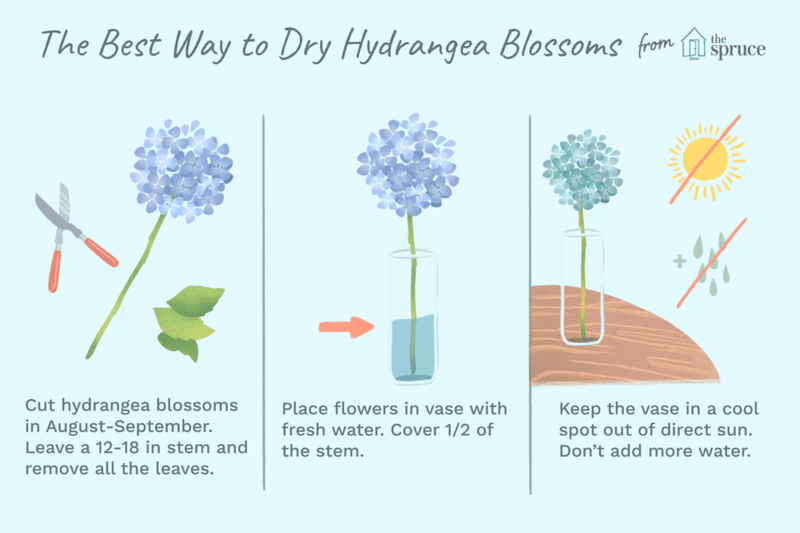 It sounds counter-intuitive to dry flowers with water, but allowing the hydrangea flowers to desiccate slowly helps them hold both their color and their shape. Even the stems seem sturdier when dried this way. The first step is to cut each flower with a 12 to 18-inch stem attached. The length is for ease of handling, it's not a science. Then, remove all the leaves from the stems. Place the freshly cut flowers in a vase with fresh water. Make sure the stems are at least half covered with water. Move the vase to a cool spot, out of direct sunlight. The flowers will still look attractive, so go ahead and display them. Don’t add more water as the water in the vase evaporates. It’s just there to allow your hydrangeas to dry naturally, rather than simply dry out. Once the water is totally evaporated, your hydrangeas should feel dry to the touch and be ready to use. If you prefer to air dry your flowers, you can simply hang your hydrangea blossoms upside down, by their stems. Because of their large size, this is best done with individual flowers, rather than bunching them together. Air dried hydrangeas tend to be a bit more brittle than water dried blossoms, but still beautiful. You can also use other common flower drying techniques, like silica gel and microwaving. While it's not optimal, you can push the timing a bit and wait until your hydrangea blossoms have begun to pick up their autumn tones of burgundy, pink, green or blue. It’s not the ideal way to dry hydrangea flowers, but you'll get interesting tones and they will keep for quite a while. However you dry your hydrangeas, expect the color to last for about 1 year. After that, it will start to fade out.